W.Va. Supreme Court Justice Robin Davis announcing her retirement on August 14, 2018. Davis, who was elected as a Democrat when elections to the bench were partisan, was the subject of articles of impeachment for her role in the overpayment of senior status judges, lavish spending on renovations to her court offices and a lack of administrative oversight of the judicial branch. Her resignation comes just ahead of a midnight vacancy deadline that would trigger a special election in November. 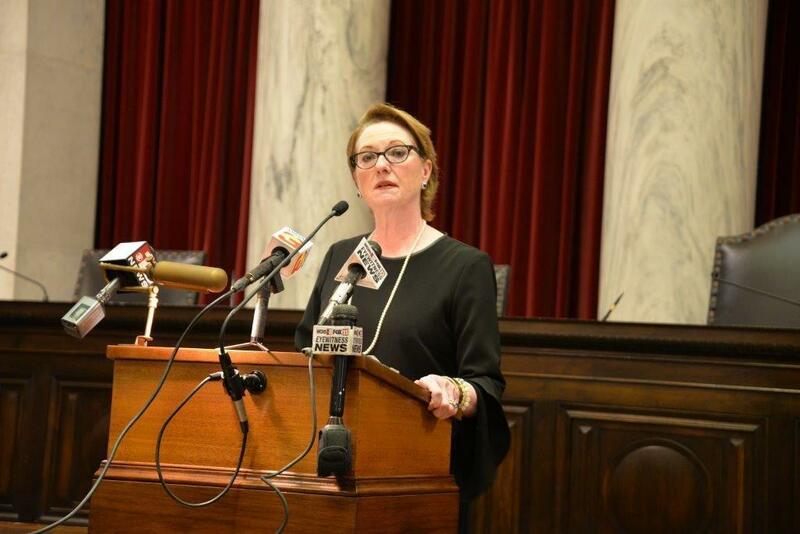 Chief Justices Margaret Workman, Justice Beth Walker and suspended Justice Allen Loughry were also impeached by the House of Delegates Monday. "When a legislative body attempts to dismantle a separate branch of government, the immediate effects -- as well as the precedent it sets for the future -- can only be deemed disastrous," Davis said of the impeachments. Davis accused the Republican-led House of wanting to impose their party preferences by way of impeachment and removal from office through trials in the Senate. Should a vacancy occur after 11:59 p.m. Tuesday, Republican Gov. Jim Justice would appoint any replacements. "The will of the people of West Virginia is being denied. I just cannot allow the finalizing of this plot to come to fruition," Davis said. "I have always put my faith in the people of West Virginia." She was first elected to the West Virginia Supreme Court of Appeals in 1996 to fill the remainder of an unexpired term and re-elected in 2000. Davis was last elected to a 12-year term on the bench in 2012. With her seat becoming vacant before midnight, the remainder of her term -- which ends in 2024 -- will be filled by a November special election. Davis' resignation marks the second stepping-down from the bench in recent months. Former Justice Menis Ketchum retired in late July -- just days before the investigation into the impeachments began in the House Judiciary Committee. Ketchum has also agreed to plead guilty to one count of fraud. The remainder of his term, which runs through 2020, will also be filled by a special election in November. After the House adopted articles of impeachment targeting the justices, House Democrats offered House Bill 201, which would call for a special election within 120 days of a justice's removal from office -- if that vacancy occurs after the Tuesday deadline and more than two years remain on the term of the seat being vacated. A motion to vote on that bill was tabled by the Republican majority.